The roof top unit contains the complete refrigeration and electrical systems, with the exception of the compressor. Mounted within the roof top unit are the evaporator coils (heating coils built-in), blower assemblies, condenser coils, condenser fans, T-X valve, filter drier, high and low pressure switches and all associated pipe-work, including the line valve and sight glass. 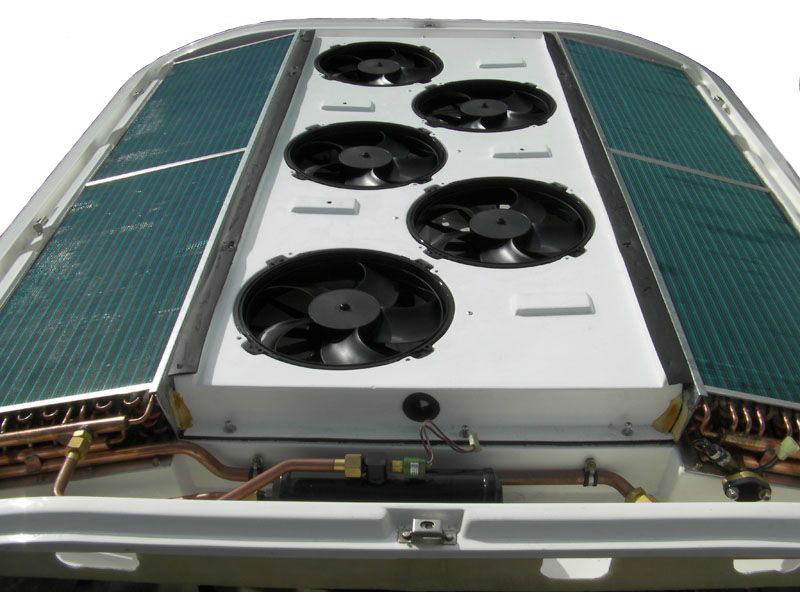 When mounted on the roof, the unit maintains a low, smooth aerodynamic appearance and operates 85% of the time on low fans speed, making it whisper-quiet and energy efficient. The case is made up of two major assemblies, namely, the evaporator and the condenser sections. These are mounted separately onto the roof before acting as one unit through the interconnecting pipe-work. Both the evaporator and condenser lids are completely removable for servicing needs, if required. 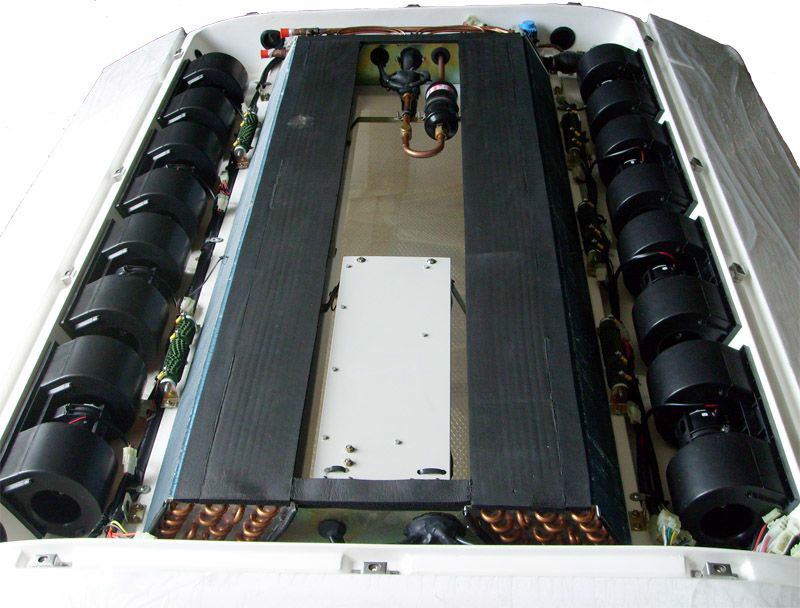 The evaporator section houses the evaporator coils (including heating coils), eight (8) blower assemblies, T-X valve, electrical board, sight glass, filter drier, low pressure switch and associated pipe-work. The condenser section contains the condenser coils, five (5) 2-speed condenser fans, liquid line valve, high pressure switch, mid pressure switch and liquid receiver tank. Fig. 2: Evaporator Assembly (Left) & Condenser Assembly (Right) under serviceable conditions. The hinged return air grill is located inside the bus, in line with approximately the centre of the unit. The returning air is drawn through the return air filter from the suction caused by the vacuum pressures of the evaporator fans, it is then blown through the evaporator coils, which are located on either side of the return filter before passing into the ducting on each side of the vehicle, where it makes it way through passenger ventilations. 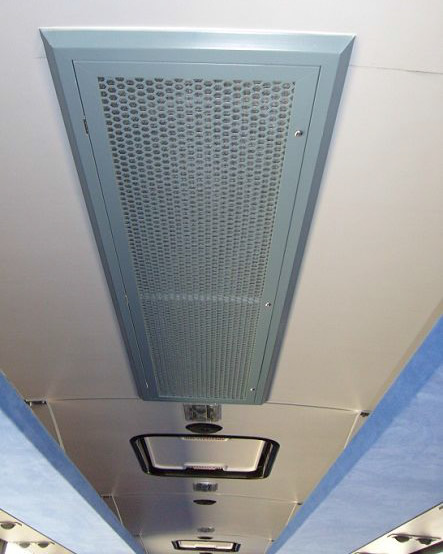 The four (4) condensate drains, two (2) on each side of the bus, located at the front and rear of the air transition outlets, level with the base of the unit. These two drain pipes then join in the centre of the air transition outlets of the air ducting into one and run in the ducting, down the nearest available body pillar and discharge onto the road, on either side of the bus. With the exception of the connection between the compressor to the pipe-work, the entire refrigerant piping system in the air conditioning unit is made of copper. All permanent joints have been soldered using a minimum of 15% silver to eliminate potential leaks. 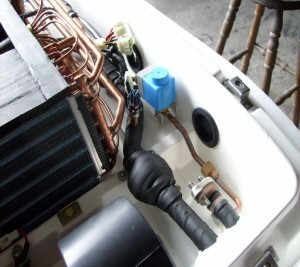 Connections from the unit to the pipe-work are located in the air transition areas, and the connections from the pipe-work to the compressor hoses, are located in the engine bay. The joints in these two locations have been connected with flange fittings. Suction line pipe size is 1-3/8″ and discharge pipe size is 1-1/8″. Both pipe-work sit side-by-side and are bound by clamps, after insulation has been placed, inside the ducting. The side of the bus to which the pipe-work is located depends on the positioning of the unit to the roof and whether the evaporator section faces the front or the rear of the bus. 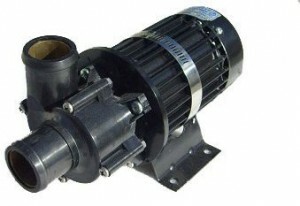 The compressor used in the system is a Bock FKX-40 (655cc) with (1) electric unloader. Mounted on the compressor is the electro-magnetic clutch, suction and discharge service valves as well as the acting safety control pressure switches. Stainless Steel braided hose connects the copper pipe-work to the compressor. The FK series are lightweight aluminium, compact and robust in design and handle a speed range between 500rpm – 3500rpm. The FKX-40 is a four (4) cylinder compressor with the K representing a unique valve plate system. The complete electrical wiring system in the unit is made to automotive specification. Each electrical circuit is protected by a fuse. Plugs are used for connections between wiring looms. Interlaced in the electrical wiring system are four (4) sensors which provide inputs to the climate controller. Two (2) De-Ice sensors, one (1) located in each evaporator coil core, one (1) ambient air sensor which measures the outside air temperature, located under the evaporator cover at the front of the unit, and one (1) return air sensor, measuring the in-saloon temperature, which is located inside the return air section. The electrical wiring also incorporates safety controls in the form of pressure sensing switches. 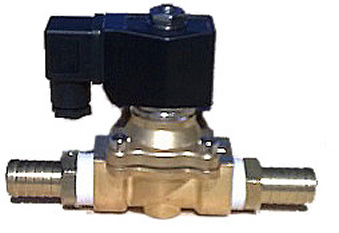 Should the pressure be too low or too high in the system, the switches will sever connections and stops the compressor from pumping, allowing for the condenser fans to decrease the refrigerant temperature, if high pressure is indicated or to protect the compressor from seizing due to no/low pressure which incorporates its lubricant. The relay board is accessed from the return air intake, housing the air-conditioning unit’s fuses and relays, as well as transmitting and receiving the electrical bandwidth from the roof mounted unit, the engine bay and the driver controls. Mounted in the engine bay is the heating valve and the boost pump. When the heating function presides, the heating valve is energized, which allows coolant to pass through the heating coils. 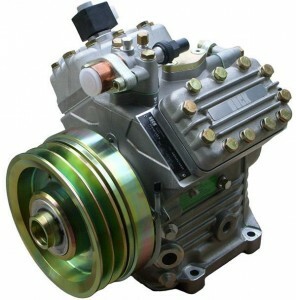 The coolant flow rate is increased by the boost pump, which is also energized by the climate controller. Located on the dash is the driver operated climate controller. The four (4) sensors provide an input to the controller from which the climate can be maintained. The 8 sensors also provide the means for the controller to display errors which represent faults in the system. The controller recognises 13 different errors and will display their relative codes respectively. In addition, the display shows the current mode and settings selected by the user. Observed in fig. 5, is the layout of both the controls display screen. 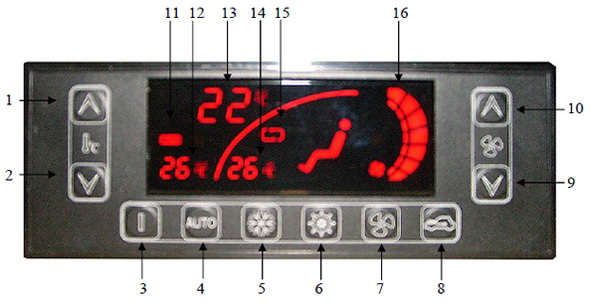 A descriptive identification of the buttons and display layout is outlined below. Sets the air-conditioning unit to auto climate control, governing the fan speeds, controlling the cooling and heating within the selected temperature. Selects cooling only mode, whereby the unit’s fans and temperature are manually controlled. Selects heating only mode, whereby the unit’s fans and temperature are manually controlled. Selects fan only (no A/C) mode, where the fans speed is manually selected. Opens/shuts fresh air intake. Can be used in conjunction with A/C modes. Decreases evaporator fan speed. Fans speed ranges from High-Medium-Low. Increases evaporator fan speed. Fans speed ranges from Low-Medium-High. Signals whether an error is present in the system. Outside measured temperature (ambient temperature). Current set temperature and location of fault error code.